Happy Humpday (and enjoy today’s testing errata)! It’s April, so let’s all stop what we’re doing and test some kids! That’s why we’re here five days a week, right? Well, five-ish. I know I should be less flippant about standardize testing, but if I were, how would you recognize me? As a state, we spend millions on tests that give us very little in the way of useful information months after the fact. At least the process is a well-oiled machine, right? You’d think that. Unfortunately, Measured Progress, our testing company has twice this week had to email us and say my bad! On Monday, it was fifth grade math. Certainly our students wouldn’t be confused at having different answer choices in their testing books as they do on their answer sheets, right? F and A are quite closely linked (in a single summative kind of way). It’s a typo. These things happen. At least they don’t cause us to invalidate tests though. Today’s problem was a different story. Because of the length of some tests, we give them in two separate sessions. So we should have different directions for each session. The lack of clarity caused some confusion and created test invalidation in some schools. I don’t know how many schools were affected. I was just told some. One was in Mid-Del, and the students affected will have to start the test over. It’s fine, though. Measured Progress is going to make it up to the kids with pizza. And no, I’m not making that up. While I make light of testing, I can tell you that our teachers and principals take the process very seriously. They’re rule followers. They don’t want to mess up and jeopardize their careers. They don’t want to frustrate their students. That’s why I try to test monitor in our schools when I can. Mistakes are inevitable. They’re still frustrating. Today is the day that many third graders, their parents, and their schools have been anticipating. Schools now have online access to student scores on this year’s third grade reading (featuring language arts) test. The data portal seems to have worked for administrators retrieving results, and statewide, scores are up from last year. For fun, let’s play a matching game. In the box below, on the left are three headlines. On the right are the sources of each. Try to guess which came from where. This is the fun thing about data. All of these things are true. Let’s see how each source framed today’s results. How did you do? If you thought that the OSDE would have the most positive approach and that the Oklahoman the most negative, you’d have been right. Also, keep in mind that the writers don’t typically write their own headlines. 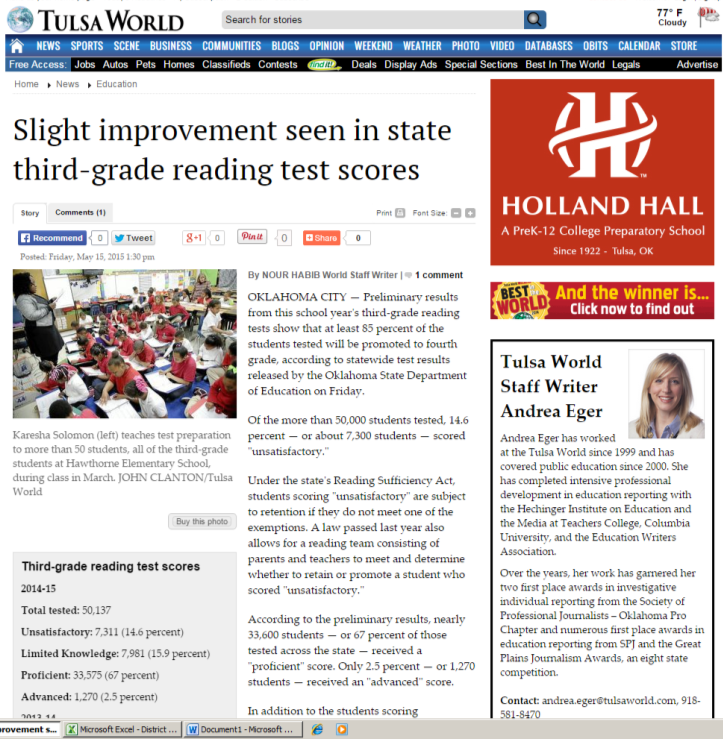 OKLAHOMA CITY (May 15, 2015) — Preliminary results from this school year’s third-grade Oklahoma Core Curriculum Test (OCCT) reading test indicate that at least 85 percent will be promoted to the next grade. Under the Reading Sufficiency Act (RSA), third-grade students who score “Unsatisfactory” on the assessment and fail to meet an exemption are subject to retention for intensive remediation in reading. Students who score “Limited Knowledge” are not held back, but must receive reading remediation in fourth grade. However, students have multiple opportunities to demonstrate mastery in the area of reading. Students can be evaluated with one of seven good-cause exemptions. State Superintendent of Public Instruction Joy Hofmeister said renewed focus on reading as a result of RSA has shown signs of improvement among Oklahoma’s third-graders. “Literacy is critical for success in academics and throughout life, and the RSA plays a valuable role in ensuring that skill,” she said. “But it is important to remember, too, that the current third-grade OCCT test given to satisfy federal test requirements was not designed to measure reading level the way it is being used for RSA. Instead, a valid reading test should include five essential elements: fluency, phonemic awareness, phonics, vocabulary and reading comprehension. The RSA committees are scheduled to dissolve at the end of the current school year unless lawmakers pass legislation to extend their existence. Additionally, lawmakers are considering a measure that would include “Limited Knowledge” students under the provisions of RSA. This year, for example, that would mean an additional 7,900 students evaluated for possible retention. Over the next few weeks, school districts are required to contact parents and legal custodians of students who scored “Unsatisfactory” and determine the most effective course of action for these children. Scores have improved (slightly, as the World indicates) from last year. This test is a poor measurement of reading ability. The RSA promotion committees have worked well around the state. Doubling the number of students in the promotion/retention committees dilutes the work needed for our most struggling students. Without the RSA committees, we will be retaining special education students and those just learning to speak English at highly disproportionate levels. Keep the RSA Committees for promotion through the 2019-2020 school year (p. 4). Add an RSA Committee for students not meeting benchmarks on screening instruments in first and second grade (p. 5). Add students scoring Limited Knowledge into the retention discussion (p. 11). The 2015 legislative session is almost over. Let your representative and senator know what you think about these changes. Please don’t take my blogging vacation to mean that I’m satisfied, however. If the tantrums (tantra? tantrii?) at the State Board of Education meeting two days after the election and the finger-wagging editorials from our friends at the Oklahoman are an indication of anything, our fight to improve respect for public education and dispel reformer myths is far from over. At the SBE meeting on the 26th, Superintendent Barresi made it clear that she is not finished fighting. At regular intervals throughout the meeting, she commented on being fought at every turn by the education establishment and other defenders of the status quo. She still has taken no responsibility for the things she did poorly – namely leading and campaigning. The Board acted on a motion to end the state’s contract with CTB, which they would have been able to do last year as well. They tabled ending the testing contract with Measured Progress, however. Interestingly, they also delayed approval of a plan to begin the standards-writing process to replace Common Core and PASS. As you probably know by now, four SBE members (appointed by Governor Fallin) are listed among the plaintiffs in the lawsuit to have HB 3399 (signed by governor Fallin) declared unconstitutional. Apparently, because of this, we can’t move forward on standards or testing. If the State Supreme Court reinstates the Common Core, we get to keep Measured Progress. If they don’t, we have to issue a Request for Proposals and select a new testing company really quickly. Now fast-forward to July 9th (while I skip several other frustrating things from the SBE meeting and the editorial pages) as the Oklahoman seemed to be still lamenting Barresi’s loss. At issue is the selection of Duncan Superintendent Sherry Labyer to lead the Commission for Educational Quality and Accountability. Commission members recently announced that Sherry Labyer, school superintendent at Duncan, had been hired as their executive director. Labyer has been a vocal critic of education reform in Oklahoma, opposing many transparency and accountability measures. Let me see if I understand this. The Oklahoman is against Labyer because she cheered for something that practically every superintendent in Oklahoma wanted – parental involvement in 3rd grade retention decisions. The combined vote of that veto override was 124-19. It was a no brainer. Labyer also has the audacity to find the state’s A-F Report Card system to be highly flawed. Again, this is the prevailing opinion of people who actually work in schools. Researchers (airquotes removed for emphasis) have proven empirically that both iterations for the system actually mislead the public. As for the Biology cut scores, this was one of the biggest slaps in the face to Oklahoma educators in recent years. The SDE actually brought teachers together to set passing scores, then went against their recommendation, causing passing rates to plummet. Students who went home for the summer thinking they had done well on one of the tests that counts as a graduation requirement came back in the fall and found something altogether different. As far as I’m concerned, this hire is just what the newly formed EQA needs – an educator leading an education agency. That’s pretty much what last month’s election was about, right? Opposing bad ideas and their lousy implementation does not make someone a defender of the status quo. As I’ve written time and again, most education leaders want to see change and progress. They just want to see it on the student level rather than the sound-byte level that those currently in power prefer. This is why we keep fighting. We all still have work to do, so I won’t spend much time discussing the election or events leading up to it. Before we move forward, though, I would like to share a couple of videos with you. I’ve already pushed them out onto Facebook and Twitter in the last day or so, but if you didn’t happen to be online at the time, you may have missed them. First is some raw video posted by the Tulsa World of the comments made by Superintendent Janet Barresi at the standards convening earlier this month. This is the Bible-quoting, go to hell speech. In case you can’t watch it on your mobile device, or if you’re trapped in a cubicle somewhere and don’t want to bother those around you, the World has also provided a transcription. “I’m determined. I am determined. Kids in Oklahoma deserve this. You deserve this. God has blessed this state and he blesses these children and I’m not going to let anything get in their way. They deserve the blessings of this state and the blessings of this country. And I need you to help me rebuild that. We are going to build a house. “Anybody that has any question what we’re doing, read Nehemiah. Open up your Bibles and read Nehemiah. I want you to put on your breast plate and I want you to fight off the enemy at the same time you’re rebuilding the wall. Because there’s a lot of people, a lot of enemies are going to try to creep up the back of your neck and say you can’t do it, it can’t be done. Do me a favor and tell ‘em to go to hell. We’ve got a wall to build. ‘Cause I’m gonna be in there with you, too. I’m going to take the hits. I don’t care, I don’t care. And then we will be, we will be an example to the rest of the country about how you produce a wonderful child that is educated and ready to take control of their life. Are there any questions? As I said at the top, I don’t want to live in the past. This becomes relevant, however, knowing what is on the agenda for today’s State Board of Education meeting. Several items catch my eye. They will be discussing where the state stands regarding our No Child Left Behind waiver. They may act to terminate our testing contracts with CTB/McGraw-Hill (for incompetence) and Measured Progress (because of HB 3399). They will also discuss the new standards-writing process. That’s where the video comes in. She makes it clear that we’re going to write the best standards in the country, which is a laudable goal, but speaks in terms of holy war. What I would have hoped she might have learned in the last four years is that teachers function best when they are allowed to collaborate. Under heightened stress, such as what she describes, the threads connecting us are more likely to sever. Combine this with video of her speech Tuesday evening, and we have a clear picture that she intends to have these standards written before she leaves office in January. HB 3399 gives the SBE two years to send them standards. School districts are still wiping the little rubber pellets away from where they’ve erased the words Common Core from all of their curriculum maps. The SDE has charged Teri Brecheen, who “led” the state’s efforts to implement the third-grade retention law. Brecheen also wrote (although it was signed by Barresi) the letter letting the REAC3H coaches know they were no longer employed. Read that again, and you’ll see more evidence of people who think this is a holy war. If it is, by the way, what does that make the rest of us? Isn’t it possible that the people who think third-grade retention is for the best, along with those who don’t, all have the best interest of children at heart? Do we have to pull from the book of Nehemiah to state our case? I simply don’t think retaining third graders is a great idea. Developmentally, it’s too late. We are slamming on the brakes while emerging readers also develop a love of books, which is key to learning to read or reading to learn or whatever you want to say. I respect your opinion, if you believe differently, unless you stick your finger in your ear when opposition comes at you. It certainly doesn’t help when you call people pathetic. This is why we must pay attention. This is why I will continue writing about anything that happens in Oklahoma education, if I feel I have something to add. We still have a state superintendent, and we must remain focused. Counting down from 20 was so much fun (how fun was it? )…it was so much fun I added a new number one yesterday afternoon. Now I’m going to add 13 more! These are additional examples of things that Barresi or the SDE have done during the last 42 months to wreck public education. Whether an example of failure by design or incompetence, each is worthy of dishonorable mention. There is no particular order to the following list. Nor should they be interpreted as Reasons 22-34. Some could easily have made the top 20. Even after this, I’m sure I’m missing something. For each, I’m going to limit myself to a paragraph or two and add a relevant link. On many fronts, the SDE has mishandled the development of the Teacher/Leader Effectiveness system. While the qualitative component that counts for half of a teacher’s evaluation has been met with good reviews overall, initially Barresi was reluctant to accept the TLE Commission’s recommendation for a model. She was hell-bent on anything but the Tulsa model (much as #oklaed is hell-bent on anything but Barresi right now). Validating the work of one of her staunchest opponents (TPS Superintendent Keith Ballard) was more than she could stomach. Unfortunately for her, more than 400 school districts went with the Oklahoma-grown evaluation model. Since the cool thing in 2014 all about growing our own, this should be ideal, right? Given that time is of the essence, to best serve the needs of districts, and to provide you with more autonomy over these funds, SDE has determined that it will indeed be most effective to distribute the $1.5 million directly to districts to seek TLE evaluator training. Some districts had already tried to secure training independently of the SDE prior to that announcement, but the SDE had blocked them. They literally kept the entities authorized to provide the training from entering into contracts with individual school districts. This announcement by the SDE then was doubly frustrating. Districts trying to be proactive were blocked. They had to wait an extra 2-3 months for the training they knew their staff needed. In April, a family in Moyers suffered a great tragedy. The school called the SDE to try to get a testing waiver for a student going through tremendous grief. It took a social media onslaught to get the agency to reverse its original decision not to grant the waiver. Eventually, the SDE caved. They said it was a misunderstanding. Barresi was also quick to blame the federal government for setting such intractable testing rules. It’s a typical JCB story. Testing matters more than students or schools. If she looks bad, blame someone else – especially liberals or the feds. Janet Barresi tells anyone who is forced to listen to her that her greatest accomplishments are transparency and accountability. As of October (or earlier – this was when I first noticed it) the SDE’s Accountability Page no longer contains API scores . The Academic Performance Index was Oklahoma’s school accountability system from 2002-2011. It was replaced in 2012 by the A-F Report Cards, which were one of Barresi’s hallmark reforms. 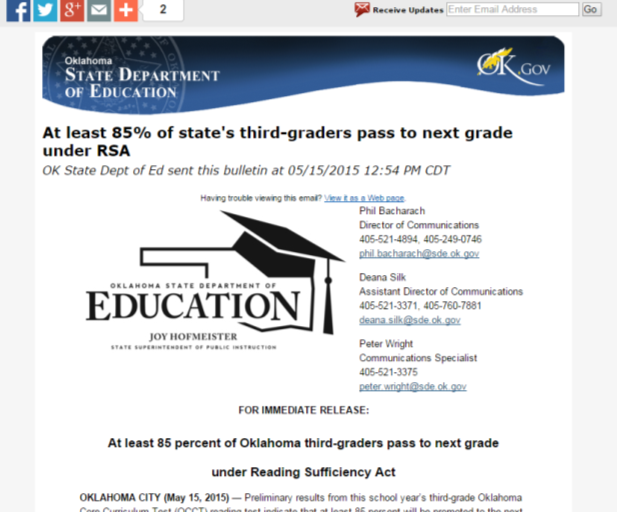 *Please Note: The State Department of Education is currently reviewing historical assessment and accountability reports to ensure compliance with the Oklahoma’s new “Student Data Accessibility, Transparency and Accountability Act of 2013.” Some sites on this web page may be temporarily disabled until compliance is ensured. Barresi likes to construct a narrative in which accountability didn’t exist before she showed up. As with most of her talking points, there is no merit to this. There is also no reason to hide old API reports. Nothing in the Act named above would require historical data to be removed. In November, Barresi participated in a candidate forum that was captured on video and posted to YouTube. That video alone could have been the basis for a pretty solid top ten list. One of the outrageous things she said was that the reason Oklahoma students can’t read is because the University of Oklahoma still teaches Whole Language. She also insists that OU and OSU need to teach their education students how to teach reading and math. Maybe she was just still bitter about the research report discrediting her precious A-F Report Cards. In any case, she simply sounded uninformed and petty. Early in the Morning of May 10th, Rob Miller received an email from the superintendent of Crutcho Public Schools. 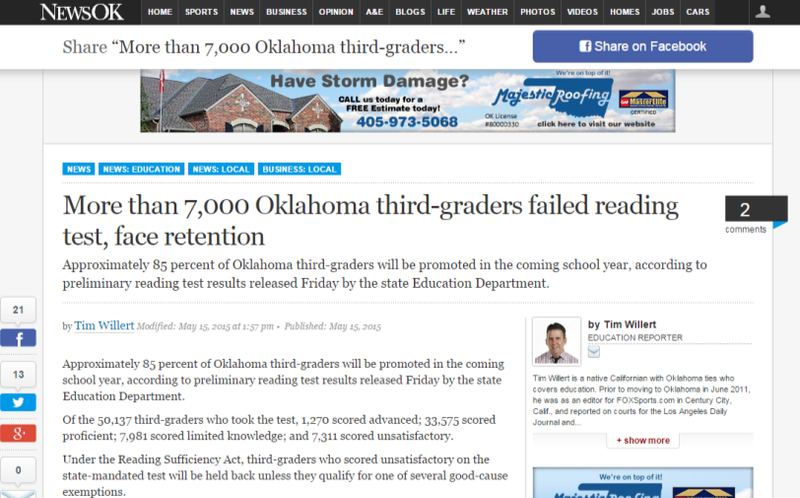 The news media had been reporting that the district had the worst 3rd grade scores in Oklahoma. Due to technical problems with CTB/McGraw-Hill (go figure), she had not been able to login to confirm their scores. The first news story reported that none of the school’s students passed the test. They corrected it at the 10:00 broadcast. Unfortunately, we all know that retractions don’t have the impact as an inaccurate report in the first place. If the SDE hadn’t been in such a rush to get scores out to the media and represent their reading initiative as a success, this misrepresentation never would have happened. Barresi doesn’t care about that – just about controlling the narrative. The most-viewed post of all time on this blog is from March: How to Lose Your Appetite. The funny thing is that I really didn’t care for the post all that much. Based on screenshots and redacted identities, I piece together comments overheard from Barresi during lunch. She thinks Sandy Garrett had no accomplishments. She thinks the legislature is crazy. She thinks teachers are liberal. She blames everyone but herself for how badly she is doing in this job. Her commercials make that perfectly clear. Normally, especially with state government jobs, an agency will post a position (and a job description). Under Barresi, nothing is done the normal way at the SDE. Did you know that Michelle Sprague, the Director of Reading/Literacy, is set to become the new Director of Elementary English/Language Arts? Funny, that position never posted to the SDE website. That must’ve been an oversight, as was the creation of the new position. Likewise, Sprague’s successor in the position she’s leaving has already been selected. That job never posted either. Throughout Barresi’s tenure at the SDE, she has fired and run off good people, often replacing them with others who aren’t qualified for their jobs. The SDE has definitely found a few hard workers who try hard to help schools through all of the challenges they face, but their efforts are often stymied from above. Maybe it’s just as well that they’re not performing legitimate job searches. There’s no point for great people to leave good jobs to go up there now. The SDE is supposed to help schools find solutions to their problems. This should not include a show of favoritism to certain vendors. I’ve covered the irregularities with the selection of CTB/McGraw-Hll and the bad decision to keep them after the first annual testing debacle in the countdown already. It goes beyond that, though. She has pushed specific professional development providers relative to the Reading Sufficiency Act and Advanced placement programs. And in one debate last week, she said that she hoped schools would go back to Saxon Math – which I’m sure thrilled all the other publishers. It’s not that I want all the vendors to be happy or all to be miserable. I just want them all to have a fair shot. Too many times, whether through sole source contracts or less-than-transparent bidding processes, they find the deck to be stacked. One component of the state’s ESEA Waiver is that the SDE will provide rewards to schools with high achievement and schools with high growth. In 2013, the first year anything other than certificates were given as a reward, only five percent of eligible schools applied. 229 Reward Schools were eligible to apply. 6 grants totaling $400,000 were awarded. 60 percent of the funds are to be spent celebrating the success of the Reward School. 40 percent of the funds are to be spent on partnership activities benefiting both the Reward School and the Partnership School. The catch was that schools eligible for a reward had to partner with a low-performing school to apply. Unless I missed it, the SDE announced no new awards in 2014. In that case, they could have used the $2.8 million set aside for that expense to make up the deficit in funding employee benefits, rather than yanking funds at the last minute from professional development and alternative education. By the way, for some reason, the legislature raised this pool of funds to $5.4 million next year. In October 2013, Janet Barresi said during a radio interview that she is “embarrassed” Oklahoma doesn’t have more charter schools. She continues not to comment, however, on the fact that the ones Oklahoma has don’t perform as well as the state’s traditional public schools. Both years in which we’ve had A-F Report Cards, even though the formula changed considerably from 2012 to 2013, charter schools did not score highly. We know that not all charter schools are created equally and that by law, they are supposed to accept students on a lottery basis. We also know that some have ways of counseling out students who might be hard to serve. And we know that they don’t face all the same regulations as traditional public schools. While I have written consistently that I oppose expansion of charter schools out of the state’s urban areas, I do not oppose their existence altogether. What I’d like to see is all public schools granted some of the flexibility charter schools have. I’d also like to hear politicians acknowledge these differences in their discussions of charters. I don’t know how many times I’ve heard Janet Costello Barresi claim that under her watch, the SDE has transformed from being a regulatory agency to being a service agency. None of us buy that. For example, on January 15, 2014, the SDE notified schools that they had changed the definition of Full Academic Year to mean “part of the academic year.” Instead of previous definitions, which had included some logical starting point relative to the beginning of the school year, we would now be counting all students who remained continuously enrolled from October 1st and before. Supposedly, there was a hue and cry from Oklahoma administrators to make this change. I have a hard time believing that. Yes, we want to teach all children we have, but the FAY/NFAY designation is really only an accountability issue. Schools with high mobility have a hard enough time without the SDE senselessly piling on via bureaucratic fiat. Patrick Anderson today said he was shocked that the State Department of Education spent $33,268.00 on its annual report. The report, which is 60 pages in length and includes 50 glossy color photos and charts, was delivered to legislators Wednesday. According to the document, the Department of Education printed 2,000 copies, meaning each copy of the report cost taxpayers $16.63. Anderson was the author of Senate Bill 1697, which directed state agencies to issue such reports in electronic format to save taxpayer dollars. SB 1697 was signed into law in 2010. In four years, the SDE can’t make this switch, but they expect schools to make more drastic changes virtually overnight? Classic. I already covered in Reason #3 in the countdown how Barresi and the SDE threatened to revoke certification from one vocal critic. In January of this year, the SDE announced that all school districts would be required to participate in the systems tests of their computers for both testing vendors. If they didn’t, they might lose funding, accreditation, or certification of administrators. This was nothing but a bullying tactic. Districts that did not comply faced no sanctions. As for the instructional time lost, we gained nothing in return. Measured Progress, which seemed like a pretty decent outfit altogether (at least more responsive than CTB or Pearson, our previous testing vendor), is one-and-done. The bill revoking Common Core essentially kills our state’s contract with them. If after all of these reasons, you have any doubts that Janet Barresi is a bully, just think back to a SBE meeting not too long ago when the elected state superintendent pulled aside an appointed board member, berated her, and shook her finger in her face, and began a fight that she will likely lose on Tuesday. Who was that board member again? Oh yeah, Joy Hofmeister. Two days to go, people. Stay in the fight. Keep writing, sharing, and talking to your friends. We can’t afford for one educator, one parent, or one voter to stay on the sidelines. Too much is at stake. Friday’s reason to pick a new state superintendent – anybody but Janet Barresi! – centered around the time and money that our state has spent on two of the central reforms that we’ve now abandoned – Common Core State Standards and PARCC. This tweet from a superintendent frames the situation nicely. #oklaed Its not the scrap of #CCSS that I'm in fear of, it's what our leg's will approve when written. Will politics win again or education? This week, both camps (the CCSS supporters and detractors) are trying to figure out where we go at this point. We just blew $4 million on a contract with Measured Progress, and now we won’t even get to keep any of the questions we field-tested. I feel like milkshake has been dumped all over my head. This is such a mess. We have worked so hard to meet these rigorous standards and now we are going backwards?! This is like a warped time machine. I did have some issues with some of my 6th grade ELA standards, like requiring 12 year olds to be able to type a minimum of 3 pages in one setting, but we were doing our best to make this happen. Will going back to PASS make our students fall behind everyone else in the nation that is continuing on with CCSS? This is such a joke. All we can do is laugh at this point and pray that Janet’s days are numbered to 17 from this moment. This doesn’t resolve our main issue of testing. This just makes things more complicated. I am so embarrassed to be represented by these fools. Every time I think we may take a positive step in Oklahoma education, they continue to dump milkshake everywhere. For two years, I have said that there are things far worse than the Common Core. If they just consisted of standards that resembled (without completely mimicking every other state), they wouldn’t be so bad. We’ve totally convoluted our testing in this state, and I’m not entirely sure the Common Core is to blame. No, the greatest insult to the profession we’ve ever seen (even more than Governor Keating calling teachers slugs in the 90s) is the idea that we can measure the contribution of every single teacher on every single student. In order to successfully collect data for the 35 percent quantitative portion of TLE, teachers will utilize a process called Roster Verification to properly link themselves to the students they teach.Why is Roster Verification important? This process is important because no one is more knowledgeable about a teacher’s academic responsibility than the teacher of that classroom! Rightfully so, teachers should have the opportunity to identify factors that affect their value-added results (e.g., student mobility and shared-teaching assignments).In order to assist teachers throughout this process, the Oklahoma State Department of Education (SDE) has partnered with Battelle for Kids (BFK), a non-profit school improvement organization. Together, SDE and BFK will provide teachers with an easy-to-use data collection instrument, Roster Verification training, and communication resources. During February, 2014 the Office of Educator Effectiveness is hosting webinars on Roster Verification. The webinars will explain how to use the Batelle for Kids program to link students and teachers accurately. Five sessions will be offered at various times. We encourage administrators and/or data personnel to sign up for a session. The same information will be covered at each session, and one session will be recorded and posted on the TLE Web page to access anytime. The question we’ve all had since the SDE started developing the quantitative measurements for TLE has been, How will they measure growth from year to year, especially when we keep changing tests? And once again, we’re changing tests. Unfortunately though, we have no idea what next year’s tests will be. In the end, someone in the field of research or public relations will tell us that we have found a way to compare scores. On the other hand, these are the same people who keep telling us that the 3rd grade Language Arts test is a Reading test, and that it actually diagnoses reading level. They’ll tell us anything. Another comment on Friday’s post was made by fellow blogger Mad Ramblings of a History Teacher. I served on the working committee for VAM. I attended 2 of the 3 meetings (I missed the 3rd because of the weather). Later we were told there were 4 meetings (Where that 4th one came from? I never quite figured that one out.) Anyway, these meetings were a mess from the beginning to the end. And pardon my vulgarity, but where the HELL they came up with their “formula” is still a mystery to me. I don’t even understand the formula, and there, I believe, is the answer to your question about the rebellion over VAM. No one knows or understands exactly what will happen when VAM is calculated into their evaluations. I think the rebellion will begin after the adverse effects of the VAM formula start showing up on teachers’ evaluations. Just look at Houston; several teachers are suing over the use of VAM. One thing is for sure; it’s going to get even more interesting around. Mad Ramblings had a nice post about this in February called My Shameful Secret. I have a terrible confession to make. I was one of the teachers on working group #3 for Oklahoma’s TLE VAM sessions. In my defense I thought I was doing something good. I know I am not the smartest person in Oklahoma, but I was vain enough to believe my fellow teachers and I could bring some much needed sensible experience to this “groundbreaking” ill-advised venture Oklahoma’s DOE was determined to try. Boy was I mistaken! They had Mathmatica. This is the same organization that gave D.C. such wonderful advice. It was so good that D.C. wrongly fired some teachers, and the method used to interpret the data so inherently flawed it can’t be fixed. No matter, Mathmatica just moved on to another state spewing the same propaganda and pocketing the big bucks. But I digress. I thought the teachers would be treated as professionals at these meetings. .. wrong again. If we brought up a topic they were unwilling to touch, we were too political or going off topic. Then to explain what they were wanting from us, they sent us papers written with grants from the Gates Foundation. Talk about being too political! I’m just going to throw out there that if it’s not ok to have academic standards that were written out of state, we probably don’t need talking points for VAM that were as well. Again, the whole idea is that we can input a whole bunch of variables into a formula and determine who is effective. For the teachers in subjects that don’t test, we’ll just make up things that we can measure and do that. The thing with VAM is that it manages to fly under the radar. The few times I’ve written about it, I haven’t had a lot of page views or shares. That isn’t to say that it’s not worth my time to listen; rather it’s as if CCSS is an in-your-face affront to so many while VAM is going to remain so low-key that we miss it. Maybe it’s that we can read the Common Core and very few of us could read (and fewer comprehend) the VAM formula. This is worse. And the SDE can’t explain it even reasonably well. For the first year that they were developing the quantitative piece of TLE, the two people directing the effort had never even been in charge of evaluating teachers. This year, they added a former principal, but largely, we still have an experience gap. My fear is that we’ll miss it until it’s too late. Worse yet, we’ll borrow other states’ talking points for adoption without paying attention to their experiences, unintended consequences, and then eventual extraction. In other words, we’re going to spend years and millions on another acronym only to toss it later. Once again, instruction will suffer as a consequence. This is what happens when the amateurs running the show make decisions without consulting the people doing the work. Speaking of the amateurs at the SDE, please read Rob Miller’s research on the myth of Barresi cutting costs at the agency. It’s a good companion piece for my #16 reason. I know that teachers try not to be political. I know many of us have worked in school districts that flinch at activism. We have nothing to be afraid of. We have the momentum. And we have right on our side. We have 17 days. We must continue being political and speaking loudly. Use your outside voice. Do whatever it takes. Honestly, it was a pleasant surprise when we found out last week that students and schools in the Jenks district were NOT randomly selected to participate in ANY of these field tests. However, when we discovered that Owasso Public Schools had also not been “randomly selected,” several of us became a little suspicious. As you may have heard, some parents and educators in Owasso made some waves recently because of their vocal opposition to implementation of Common Core State Standards (CCSS) in their district. Therefore, this news was way too coincidental for random chance. So, I took it upon myself to make a few inquiries by phone and email. It did not take long to discover that we and Owasso were unique and that every other district in our area had been selected for this field testing. A conversation yesterday with an executive at the headquarters of Measured Progress revealed what I suspected. Measured Progress was given specific instructions by the Oklahoma State Department of Education to draw their testing sample from all districts in Oklahoma, with the exception of two school districts: Jenks and Owasso. This information has been confirmed separately through sources at the state department. It certainly appears that “someone” at the SDE knowingly excluded these two districts to avoid negative publicly associated with a possible parent opt-out this spring. Measured Progress admits that the SDE told them to exclude two districts because they have outspoken patrons. How in the hell did they expect to get away with this and not have backlash? This action undermines everything that field testing is supposed to accomplish. Aside from that, it serves as encouragement to districts whose patrons want to defy the SDE. The blame for this decision falls entirely on Superintendent Barresi. This isn’t like last year when she explained that she had taken no part in choosing the testing company that miserably failed in two states. This was planned and approved at the highest of levels. I honestly don’t think she can’t loan her campaign enough money to get out of this hole. Once again, we see the arrogance of Barresi and her administration fully exposed. This action is unethical. While admitting the motivation behind it is at least honest, they really thought there would be no consequences. Since Rob posted this story to his blog last night, it has gone viral. I told him that he would break WordPress. Last night, when I refreshed the story about an hour after it posted, the site was down. It happened this morning too. Thousands of shares later on Facebook and Twitter, it’s hard to really calculate the reach of the post. I’m sure it will reach pretty much every teacher and administrator’s inbox in the state. There will be questions from the media and from lawmakers. Speaking of which, I haven’t seen a flood of supporters stand behind Barresi lately. This won’t help. Parent power: You have the power to tell the SDE to stick it! STEMming the tide of Opt Outs! You can’t opt out; I’ll opt you out! I’d go to that last one. It sounds fun.